Action buttons (probably Z and X): One of them loads some other swatches, one of them shows a big version of the selected swatch. I made this a while ago to help me to select fill patterns and colours when working on other carts. 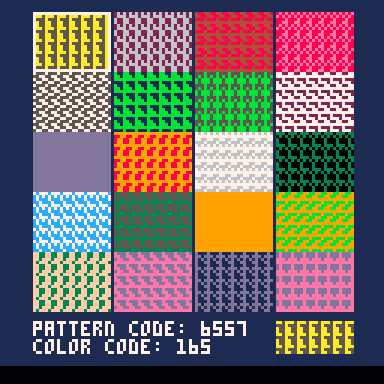 Every time you load the cart, it gives you 16 randomly-generated swatches. I've found this very helpful when figuring out aesthetic details for other projects. Use the arrows to move the select box around, and the details of the selected swatch will show below. The pattern code is to be used with fillp() and the colour code is to be used anywhere you'd set a color. These numbers would be easier for humans to interpret if they were shown in binary and hex respectively, but I kind of like the layer of mystery tbh. Hope someone else finds it helpful!